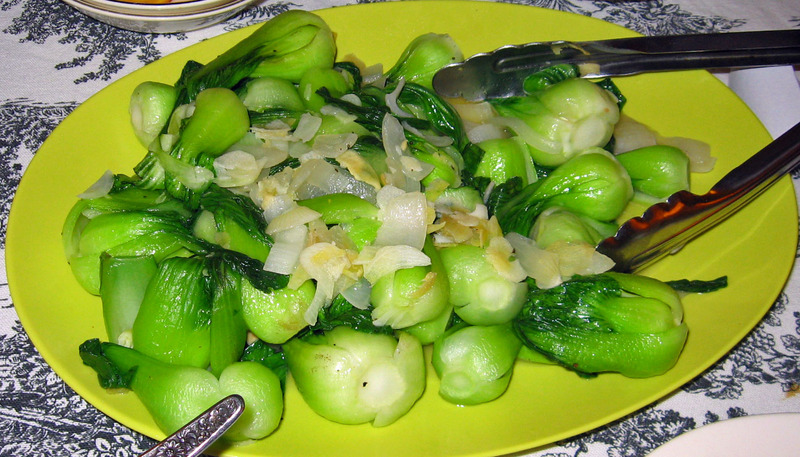 Bok choi is a vegetable which is high in Vitamin A, Vitamin C, and calcium, and often used in Asian cooking. For those of us who are dairy-free, vegetables high in calcium are a good thing. A relative of the turnip, bok choy has a light sweet flavor, and it’s low in calories. I developed this recipe trying to replicate a dish that my favorite local Vietnamese restaurant serves. The flavors are wonderful and I think it takes all of ten minutes to cook once your prep work is done. This is a great side dish to go with other Asian dishes, and my husband and I find it also complements a steak very well. 3 tablespoons of Earth Balance soy free vegan margarine. Using a large deep frying pan with a tightly-fitted lid, melt margarine in frying pan over medium high heat. Add onion, garlic and ginger, stirring occasionally until onion just becomes translucent. Add bok choi to pan and mix well. Put lid on bok choi to steam for a minute or two. Stir contents, and replace lid for another minute or two. The bok choi is cooked when leaves are limp and top of stem connected to leaf begins to soften. What are some of your favorite restaurant foods that you’d like to see us try to make allergy-free? Let us know. Also, if you try this recipe, please let us know how it worked for you. The banner looks great. I’ll definitely be checking in to see what you guys are doing. That would likely work just fine. Do you know of other unprocessed oils that are not coconut?